Dearest Blog: With Batman v Superman: Dawn of Justice opening worldwide this weekend, it's a fair bet I'll be spending most of my holiday break at Marquee Cinemas. As goes the Bat, so go I. Probably the biggest spoiler here is that I loved this movie, otherwise nothing you wouldn't know from the many trailers and clips making the rounds. As the world wrestles with the pros and cons of Superman's protection versus his unchecked power, Gotham's most famous resident weighs in. Dear Reader(s), if you have access to a computer or a tablet or a smartphone or a TV, you've probably already heard somebody say something bad about Dawn of Justice. I am here to tell you why the naysayers are wrong, and, though it may surprise you, I have more (if not better) reasons than: "Batman. Duh." 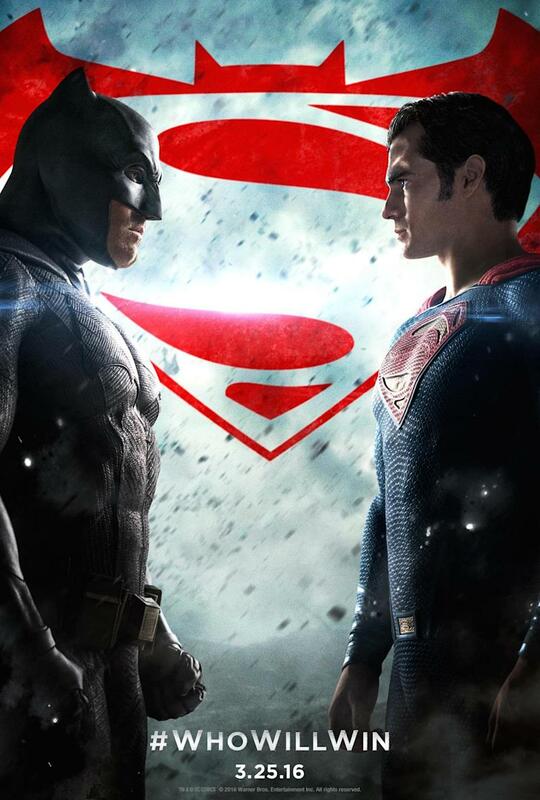 Batman v Superman is an epic tale, crafted by a fan for fans. This picture is setting the table for what's to come, and, as such, it's got a lot of balls in the air, and plenty of appearances that earned applause from the crowd each of the three times I've seen the movie so far. Ben Affleck is not only a great Batman/Bruce Wayne, he is ideal for where the DC cinematic universe now finds itself. He's older and more jaded, but no less strong or purposeful (some might say pig-headed!). I was a little stunned by the vitriol directed at Affleck's casting--the guy's always seemed a bit benign to inspire such passion--but I confess, seeing him in the Batsuit gave me a mad crush that went from zero to Renner in exactly two hours and 31 minutes. Most of the supporting cast is equally terrific, with Jesse Eisenberg unsurprisingly the standout as super-villain Lex Luthor. Gal Gadot makes a fantastic Wonder Woman, and from the young men's reactions at Thursday night's sneak-peek...well...let's just say I'm glad I don't have to clean that theatre. Jeremy Irons, Amy Adams, Diane Lane, and Laurence Fishburne all contribute more than their fair share towards elevating the movie from good to great. Batman v Superman boasts sweet fight choreography, nice effects, some intense battles between good and good as well as good and evil, and a fair few chuckles, too. Dawn of Justice does have some flaws, and, lest I be accused of too much fangirling, it's only fair I mention those. Like so many movies these days, this one could have used a trim. Coming in at two hours or even two-fifteen wouldn't have cost the picture any massive cuts, just an edit here and there on those lengthy battles, chases, and flashbacks/dream sequences. The titular faceoff, in particular, though any fanboy's dream, strays a bit into overkill. Holly Hunter is a great actress, but listening to her speak is like nails on a blackboard; by her third line I'd have given anything to have ANY other actress in her role (except maybe Carey Mulligan, because we all know how I feel about that one). And then there's Henry Cavill, bless his perfect, perfect self. Cavill attempting to cob together memorized dialogue with the appropriate facial expression is nearly as difficult to watch as Charlie Hunnam desperately trying to cling to an accent for more than five minutes. I adore Cavill, and I think he's about as perfect a Superman as a person could want, but his acting chops could use some work. Truly, those are the only problems I had with Batman v. Superman. My bottom line on Dawn of Justice is this: Many people were determined to hate this movie before they ever saw it; that is the unfortunate reality of the Internet age. Many people are determined to compare the movie to Marvel in general, and to the upcoming Captain America movie in particular, but DC is DC; it is not trying to be Marvel (nor should it), and I'd rather enjoy each for what it is than pick either apart for what it isn't. At last check, there was about a fifty-percentage-point difference between critics' and fans' ratings of Batman v Superman over at Rotten Tomatoes, so I guess, you, dear Reader(s), can let somebody else tell you what to think about this movie, or you can go and see for yourself. If you go with an open mind, I think you'll enjoy what you see. Batman v Superman: Dawn of Justice clocks in at a whopping 151 minutes and is rated PG13 for "intense sequences of violence and action throughout, and some sensuality." While it's not *quite* as magnificent as The Dark Knight or Watchmen (each of which holds a spot in my top ten movies of all time), Batman v. Superman: Dawn of Justice is an entertaining epic and a perfect launchpad for DC's next phase. Of a possible nine Weasleys, Batman v Superman: Dawn of Justice gets eight and a half. Oh, and, for the record, I've got a milestone birthday coming up this year, so somebody be a dear and get me Affleck in that Batsuit, won't you?